Ok, let me see a show of hands. Have you ever designed or installed Fluid Power Systems that used flow controls? Our guess is close to 99%. Let’s ask another question. How you ever thought about the fact that using a flow control wasted energy? This number is most likely closer to about 15%. After you read this article, you will never again be able to specify or install a flow control without feeling that twinge reminding you that you are wasting energy. Now, we are not suggesting that we eliminate flow control altogether. One of the beauties of Fluid power is the fact that we can regulate the speed of linear and rotary functions from a single power source. This requires some type of flow modulation. What concerns me is that we may consider the energy consumed by the control as just part of the cost of using Fluid Power and not take into consideration the impact our choices may have on the cost of operation and on our industry. There is no such thing as an energy efficient flow control. A system that requires flow control will always be generating more flow and pressure than is needed and the excess is wasted energy. The best we can do is to limit the waste. A pump pushes a volume of fluid at a pressure determined by the resistive load. By definition then, we charge the fluid with energy. If we require something less than the full flow at system pressure, the excess energy will be lost. Pneumatics and hydraulics have significant differences in the way energy is lost when using flow control. The pneumatic loss is more subtle and often more expensive than that with hydraulics. You are not likely to burn your hand on a pneumatic needle valve but some of us have seen the paint burnt off a flow control in a hydraulic system. With hydraulics the wasted energy can have a dramatic and immediate impact while pneumatic inefficiency tends to lurk in the background. The difference is in the way the energy is put into the fluid. Hydraulics is sort of a “pay-as you-go” system. There is usually no energy charge in the fluid until we begin to use it. 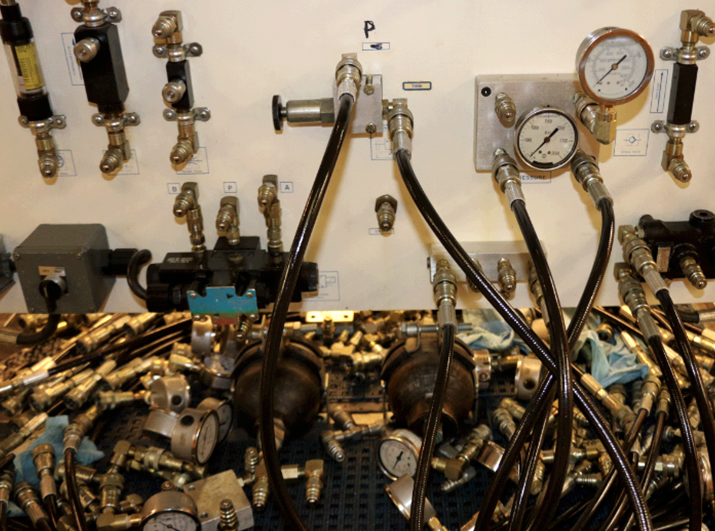 With pneumatics we charge the fluid with energy and then store it in a receiver for future use. When we waste hydraulic energy it immediately turns to heat and we have to deal with it. When we squander our stash of stored air molecules, it can often go unnoticed. An NTT Training subject matter expert was invited into a manufacturing facility where they make threaded brass parts. They have a number of pneumatic presses that are used to secure a ferrule into a fitting. The press operators used to place the ferrule into the fitting and then quickly move their fingers out of the way while they activated the press. As a safety measure the company had decided to use a horizontally mounted air cylinder to slide the ferrules into place and so prevent the operators from endangering their appendages. The ferrules weigh about 2 ounces. Someone (I am hoping it was not a Fluid Power Professional) had selected cylinders with a 2” bore to push the ferrules into position. There were directional valves and meter-out flow controls. The system worked quite well and everyone was happy. The SME noticed that each machine had a pressure regulator with a gauge. The pressure was set at 100 psi. Now, Blaise Pascal informed us that F = PA. The area of a 2” bore cylinder is 3.14 square inches, so… let’s see; 100 psi times 3.14 square inches equals… 314 pounds of force! Did we mention the ferrules weigh 2 ounces? I think it was Isaac Newton that informed us that F = ma. If we have a whole lot of F and not much m, we get a very large a. Unregulated, the cylinder force would have accelerated the ferrules to 194 miles per hour by the time it reached the end of the six inch stroke. To prevent the operator at the next work station from constantly having to remove the imbedded brass ferrules, the meter-out flow controls where used to slow the system down. It worked great! However, the air system supplied about 313 pounds more force than was required. In energy terms, our Fluid Power customer used up 313 times more of his stored air molecules than was necessary to get the job done. While working for a new hydraulic distributor who dealt with mobile and marine customers, we sold a fixed displacement pump that produced twice the flow that was required for a street sweeping machine. When the problem was discovered, one of our countermen gave the customer a 50/50 restrictive flow divider to fix the problem. He told the customer that half of the fluid would now be diverted to the reservoir and his system should work correctly. The first report we got was that things were great and the customer was pleased at the easy fix. But soon after, we got the call that the system was overheating. What the counterman did not understand is that a positive displacement pump is a relatively unintelligent device. All it knows is that it is being driven by a prime mover to push out fluid against a resistance. It has no idea how much fluid is needed or how big the resistance is. It will push until something gives way or until it reaches the limits of the prime mover. If we add any type of restrictive flow control to the fluid stream, the pump will still have to push all the fluid against the resistive load; it will energize all the fluid. The energized fluid that does not perform useful work will release its energy in the form of heat at the location where the pressure is reduced. In the case of the street sweeper, about 11 gallons/minute at 1500 psi were being released into the already undersized reservoir adding 425 BTU/minute. Going back to the overpowered ferrule transfer system, how do you set up the speed control for a pneumatic system that will minimize the energy loss? Here is the ideal way to set the flow control for a pneumatic device: First, choose a cylinder that can develop an appropriate force for the work to be accomplished given the available system pressure. Install a pressure regulator upstream from the directional valve if the load is the same extending and retracting or on each of the working ports if there is a substantial difference in load extending and retracting. Then add meter-out flow controls to the working ports. Open up the flow controls all the way. Set the pressure regulator(s) at the lowest available pressure. Apply the load to the cylinder and energize the directional control. The cylinder should not move. Now increase the pressure until the load begins to move. Continue to increase the pressure until the cylinder is traveling a little faster than desired. Now adjust the meter-out flow control to tune in the desired speed. You now have a system that will not squander the inventory of stored air molecules. Ok, how do we deal with the street sweeper? Well, we should try and apply the correct pump. But sometimes that is not practical. There is a way to divert the extra fluid to the reservoir without wasting very much energy. By using a displacement flow divider (usually a gear flow divider) we can do some amazing things. If we had directed the flow from the 22 gallon pump on the street sweeper through a 50/50 displacement flow divider, something very different would have happened. Half the flow would have been directed to the work and half would have been directed to the reservoir as before. But this time the extra fluid would be used to boost the pressure in the working fluid. The result would be a resistive pressure of only 750 psi applied to the total flow. All the fluid would be doing useful work and so the only wasted energy would be that used to rotate the displacement flow divider. We will continue the discussion on flow control and the special functions of displacement flow dividers on future hydraulics series of blogs. If you are interested in learning more about fluid power and hydraulics training programs from NTT Training call (855) 712-7353 or CONTACT NTT TRAINING today!